In light of the severity and imminence of global warming's consequences, many have proposed using geo-engineering as a means to act swiftly against climate change. Geo-engineering techniques under consideration include solar deflectors, atmospheric aerosols that increase stratospheric and/or cloud reflectivity, and advanced methods of carbon capture and sequestration, among others. However, these methods are expensive and unproven, making them high-risk propositions. These carbon savings can substantially slow the rate of climate change and delay the worst impacts of global warming. 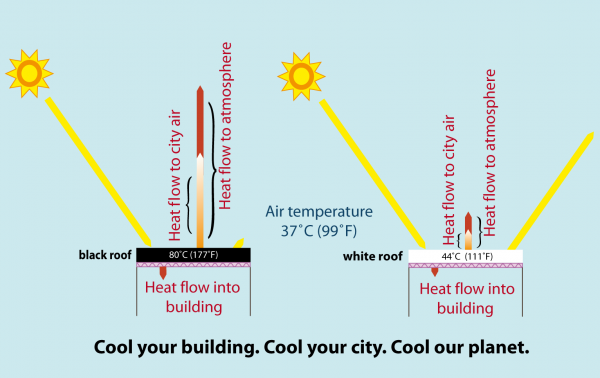 As more cities around the world implement cool surfaces, the global benefits will accrue even faster. 11 Millstein D, Menon S. 2011. Regional climate consequences of large-scale cool roof and photovoltaic array deployment. Environmental Research Letters. 6:9. 12 Menon S, Akbari H, Mahanama S, Sednev I, Levinson R. 2010. Radiative forcing and temperature response to changes in urban albedos and associated CO2 offsets. Environmental Research Letters. 5:1-11.